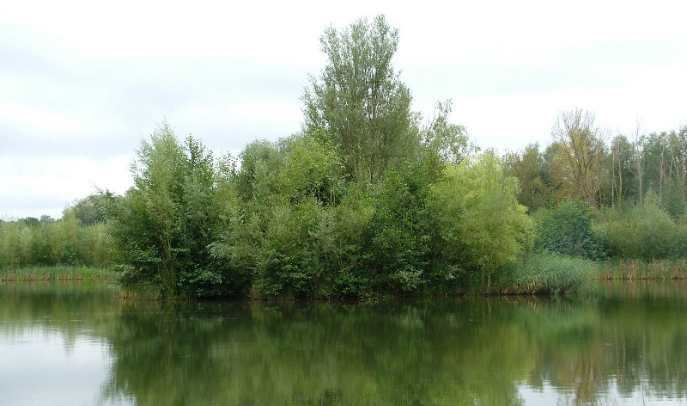 As Theale Fisheries' day ticket water, the intimate Island Lake extends to approximately 2.8 acres and has one large island. Currently there are 25 platforms or swims but we have chosen to restrict the number of anglers to a maximum of 12 at any time. This supports our desire to maintain a healthy stock of fish and make fishing here a more pleasurable experience. With its reed-fringed margins and overhanging bushes it provides exciting margin fishing for those anglers prepared to sit back quietly. Alternatively fishing for the prolific 'bubblers' or to the island margins for patroling fish can provide excellent results. The current carp stock is estimated to be in excess of 150 fish after complimenting the originals with 60 of our own stockies. These were introduced in January 2013 in the 5-8 lb range and the largest are now approaching 20lb. The recent lake record is 30lb, with five different fish having been out over 24lb, with a number of other low 'twenties' backed up by numerous upper-doubles and some smaller fish. Some of the twenties are below and for more Island Lake fish click here. With the right approach this is a year round venue with fish caught every month of the year. Even when its frozen !. Day tickets and night tickets are available through this website but must always be purchased in advance. No tickets are sold on the bank and no one is allowed to fish without a ticket. Please ensure that you are familiar with the rules that apply to the site, the fish and you, and we remind you that a maximum of two rods per angler is allowed on Island Lake. Junior anglers, under 16, must be accompanied by an adult at all times while those aged 16 to 18 can fish unsupervised providing a parental consent form is completed in advance.